Allah is conversant with everything; He comprehends all things in His Knowledge: the evident and the hidden, the slightest and the most awesome, the first and the last; He knows the ins and outs of everything. The comprehensiveness and clarity of His all-inclusive Knowledge can not be perfectly estimated or comprehended by the human mentality. - Allah’s Knowledge is infinite and vast. - His Knowledge coincides and is in perfect conformity with the true nature of the acknowledged. - His Omniscient Knowledge precedes the existence of the acknowledged, and is not gained through the existence of things, but all things gainexistence through His Knowledge. - His Omniscient Knowledge is prone neither to variation nor alteration; It is neither increased by information nor decreased by forgetfulness. The honour of sciences and knowledge corresponds with the honour of the acknowledged; the most honourable of all the acknowledged is Allah. Therefore, knowing Allah is the best knowledge ever known; He is the OMNISCIENT Who knows everything about Himself and His Attributes eternally and permanently. This Omniscient Power is one of the epithets that are related to His Exalted Self like the Divine Will, that originated events in their eligible time and in accordance with the eternal Omniscient Power that had preordained everything. 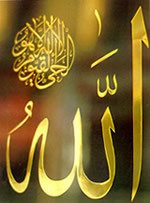 Glory be to the OMNISCIENT, Praise and Glory be to Him, He is Allah.